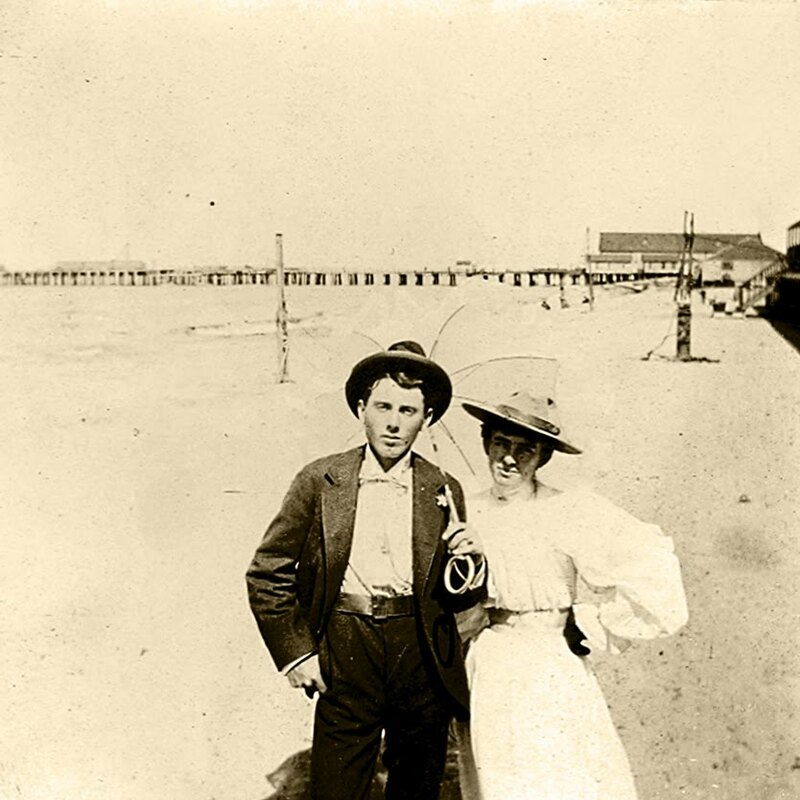 This week's vintage post is on the beach community of Redondo Beach, California. This also happens to be where my son lives, so I can honestly say it is a lovely place to visit. 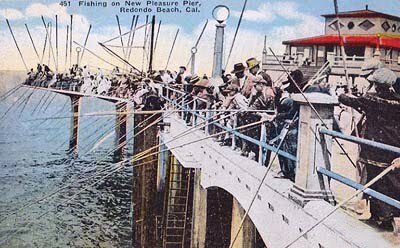 "Redondo Beach in the 1910s and 1920s was one of the best-attended weekend getaway spots in America. The beaches, pier, and downtown were jammed with vacationers and the Hollywood crowd. 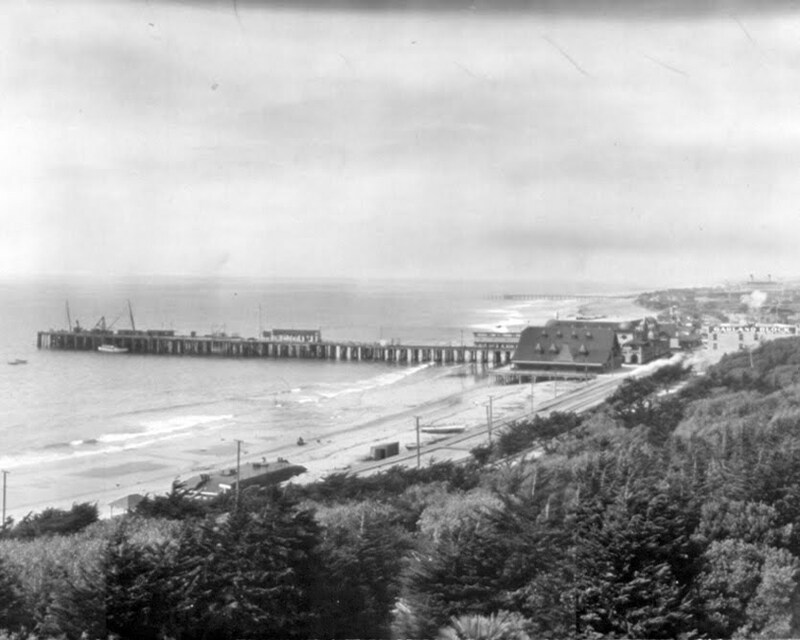 Water sports mavens drawn to the area included the great surfing pioneer George Freeth, who became a local icon. 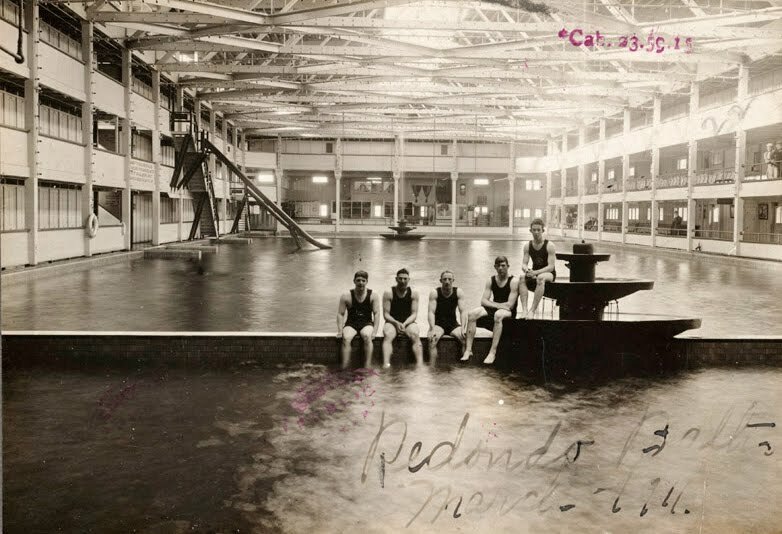 At one time, Redondo Beach boasted the worlds largest indoor plunge along with visionary tycoon Henry Huntington's enormous Hotel Redondo overlooking the Pacific Ocean. 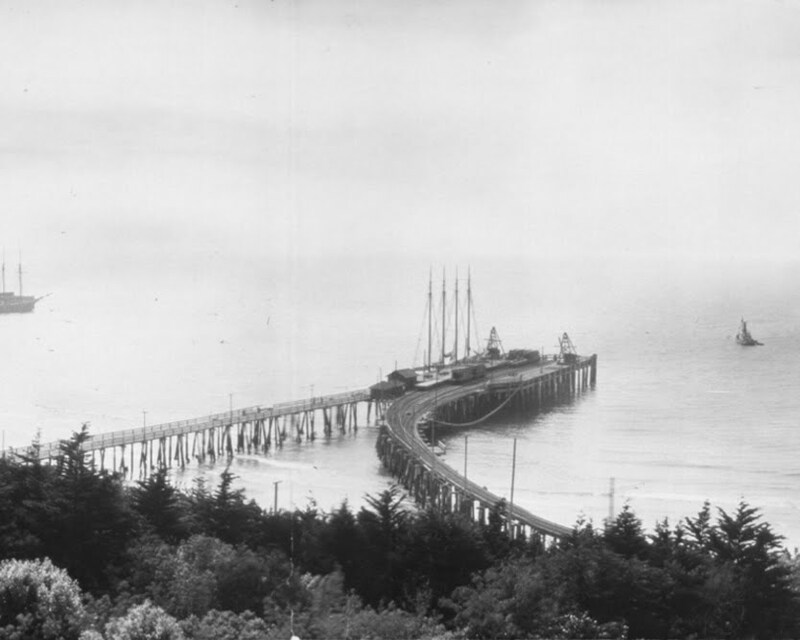 The town grew as an import-export point for the City of Los Angeles until political powers decided to put its main port in nearby San Pedro. 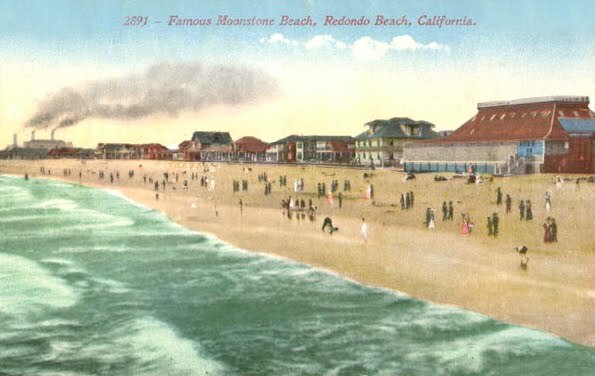 Since World War II, Redondo Beach has evinced a quaint charm as the jewel city of Santa Monica Bays southerly shores." 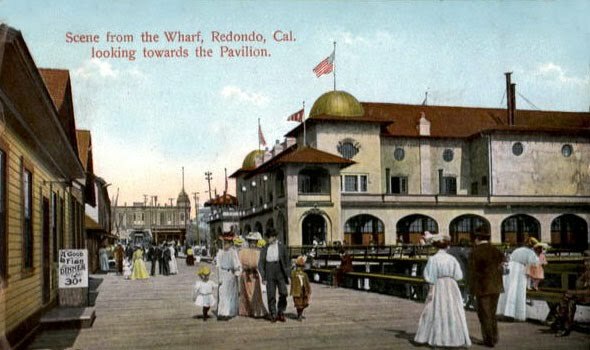 The Hotel Redondo opened in 1890 to accommodate the influx of tourists. 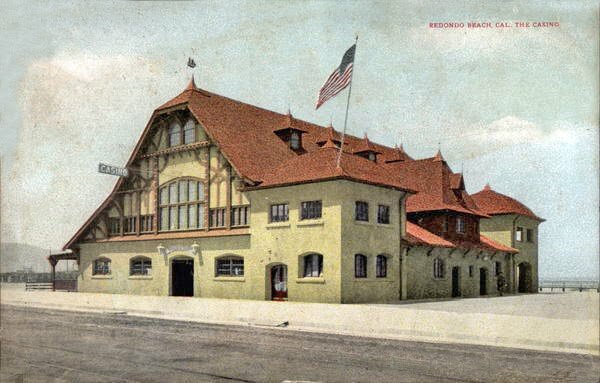 Redondo was the first port of Los Angeles County and as such steamers, as well as the railroads, brought people by the thousands to enjoy an oceanside vacation. 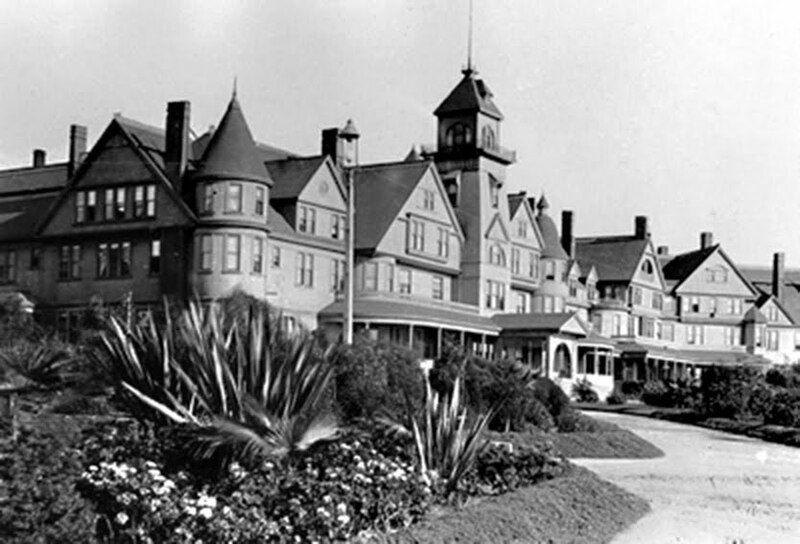 The hotel had an 18-hole golf course, tennis courts and 225 luxurious rooms. For those who could not afford hotel accommodations, there were tents to rent at Tent City located on the property. I imagine these were much like the tents located in Coronado that I wrote about over the summer. 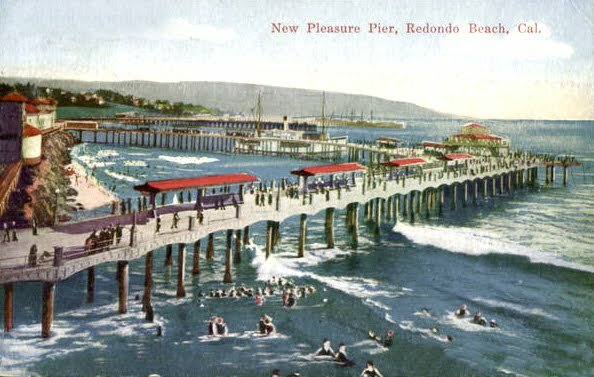 Visitors enjoyed many attractions, as we will see, but when they started to build the San Pedro Harbor in 1899 the popularity of Redondo began to slow. 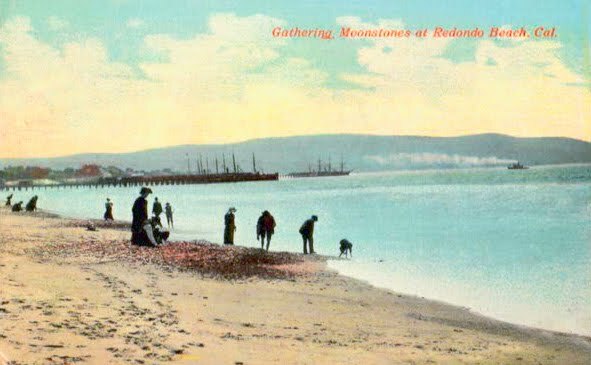 The steamships came less and less frequently and because of Prohibition the $250,000 Hotel Redondo closed its doors in 1925 and was sold for scrap lumber for the ridiculous price of $300! Wouldn't you have just loved to have gone through and collected doorknobs, chandeliers and other such things? The above photo was a gift to The Museum of the San Fernando Valley by David High in July 2009. I wonder if they are relatives of Mr High? 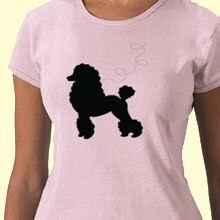 (This is an enlargement of the left side of the panoramic above. 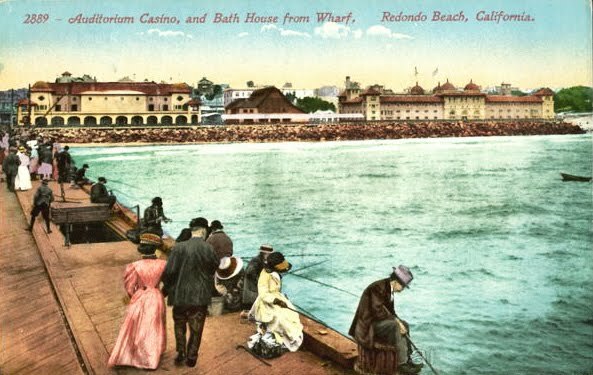 Maureen Megowan on the History of Redondo Beach reports that, "Gambling, complete with mobsters and shooting incidents, found its way to Redondo during the Depression. Chip games, bingo parlors, and a casino were run in full view of the law between 1936 and 1940. 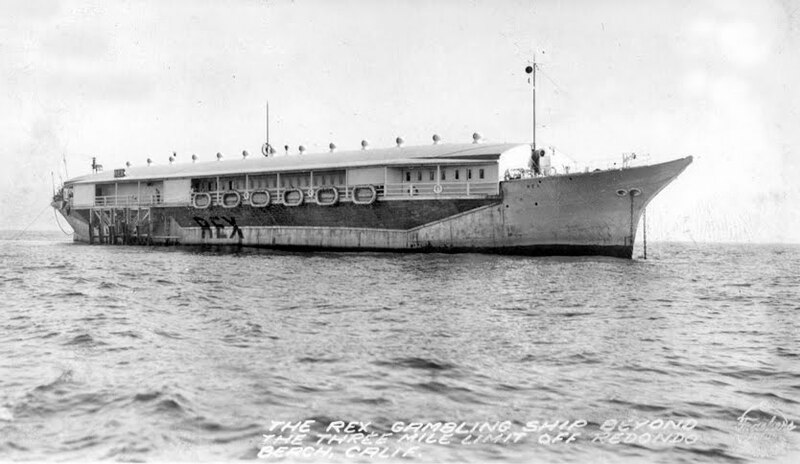 For a fare of 25 cents, a water-taxi would transport a visitor to the gambling ship Rex which operated three miles off shore." Oh, if you decide to visit, make sure to tell my son I said hello and remind him to call his mother. I always love your vintage posts! The photos are amazing!!! Hello hut! Great post today. 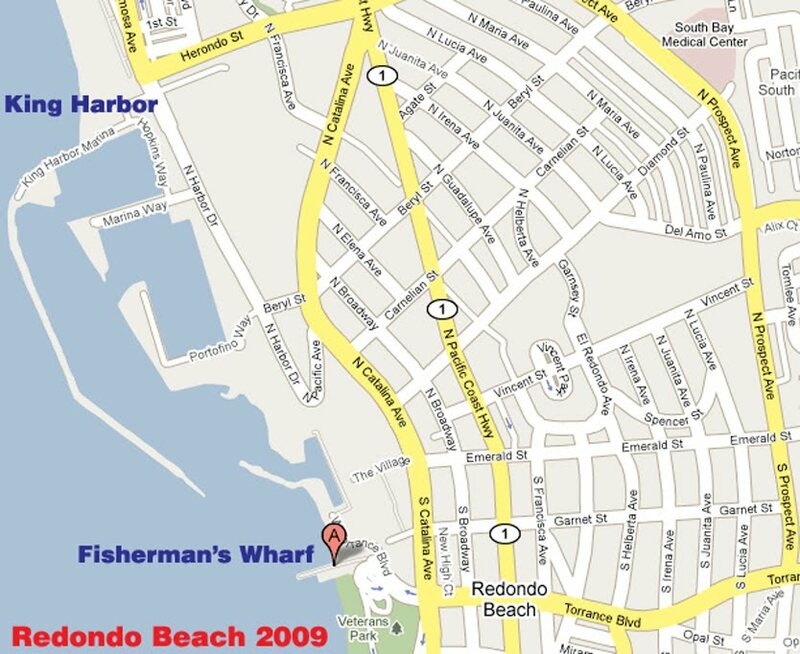 This is so cool to me because my older brother actually lives in Redondo Beach currently. He seems to love it out there. It looks beautiful and only makes me want to get out there and visit him faster. Great photos!!! I've been there years ago!!! This is great.. 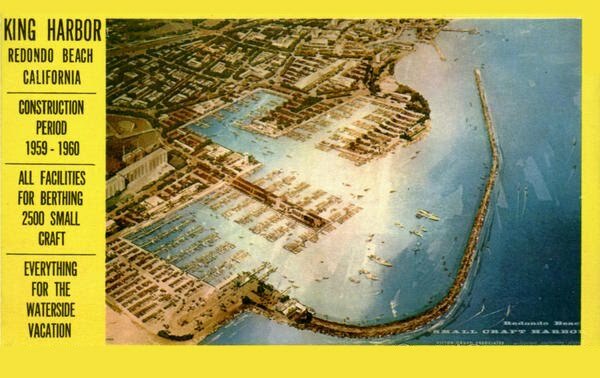 I love all these vintage images of Redondo beach and it's pier and buildings. 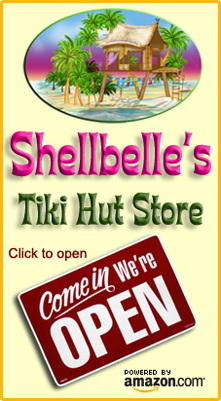 You know the only reason I even Know of this place if from Jennifer at J Beaudet Studios. She used to live there. I'm going to send her over to see this lovely post! PS I just realised you weren't in my sidebar.. ooops fixed that now..
You find the greatest old postcards and photos!! 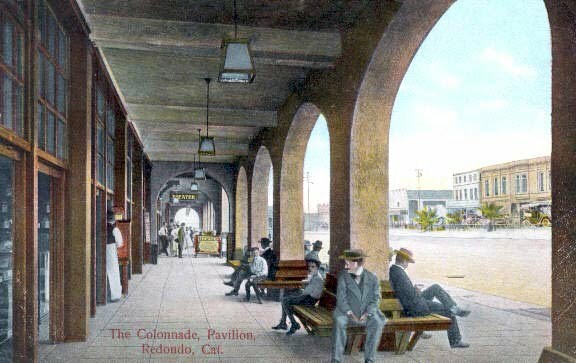 I can't tell you how much some of the old postcards -- in particular the one of The Pavilion -- remind me of old Asbury Park, NJ. Uncanny, really. Maybe I can try to convince them that to adopt the tagline "Where Cookman Ave kisses the Atlantic Ocean." That sounds so romantic and can maybe help get it up and running again, lol! I'll be sure to tell him! That 1st photo... looks more like an entire village than a hotel! Fascinating, Rhonda! Loved reading this. 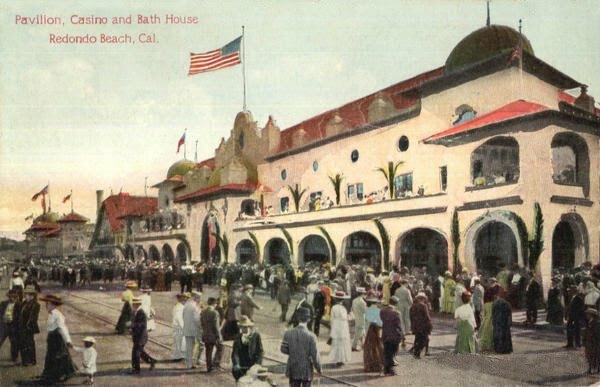 I find it fascinating that so many beaches used to have huge hotels for escaping the heat and mosquito-borne diseases. So many of them burned. The beach we visit on the east coast is very non-commercial now, but in a different time it had a hotel, skating rink, dance pavilion...and a trolley that took the folks from the nearby town over to the island. Sounds like fun until you notice how many clothes the women are wearing. WHEW! I so enjoyed this post of yours Rhonda! 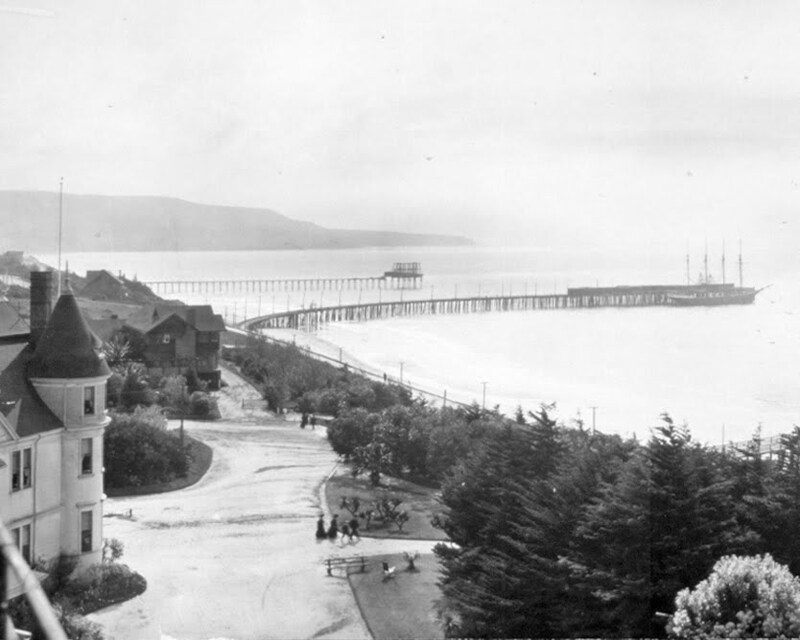 There were a few gorgeous old houses left from that time, right along the beach. Growing up I imagined being able to live in one someday. I love learning about the history of this area! I never knew any of this. I think the bath is now the seaside lagoon but it's not enclosed. I guess they had it enclosed so they could enjoy it year round. It's mostly for children now and they don't mind the cold! Your post has filled my head with so many wonderful memories and has just about brought me to tears. I could go on and on but I'll stop now. I miss that place so much! Thank you so much for this special post! 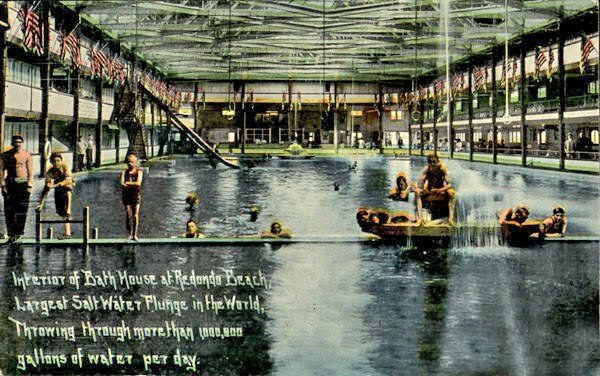 I wish these kind of bath houses would still exist! So nothing was salvaged of that great hotel?! 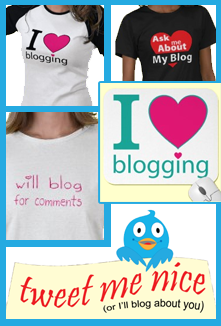 So cheers to another great year of blogging! And thanks so much for being such a good friend!! I remember now that your son lives not too far from me - I live near Newport Beach. 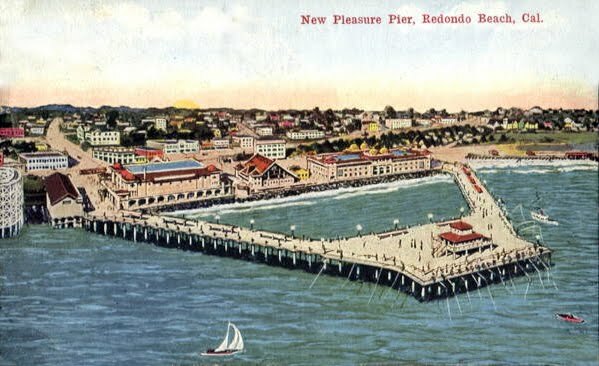 I have never been to Redondo beach though! I will have to check it out, it is not too far from BK's apt. I love these vintage photos. 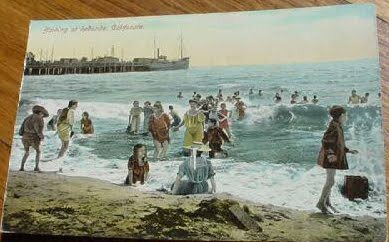 Wouldn't it be fun to go back in time and be at the beaches before they were all cluttered up? Thanks for another fun vintage post! Great post. 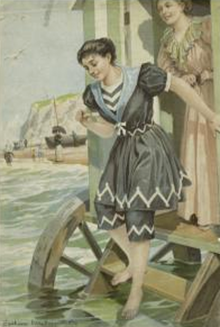 Love the vintage beach photos. This was really interesting! 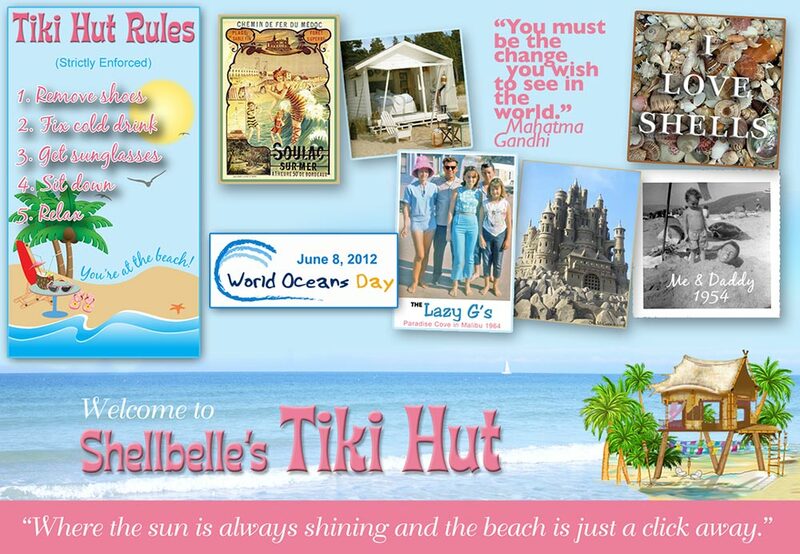 I left a little surprise for you on my blog...check it out! i love learning the history of cities, especailly beach cities. 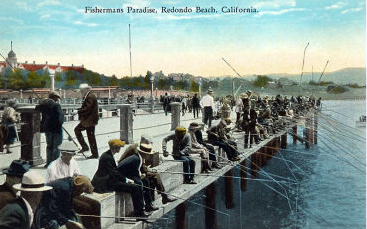 When I first came to the states as a young child, redondo beach was one of our first outings. Love all the pics of the old days. Have you been back lately? Celebrity Mystery Guest, Sign In Please! 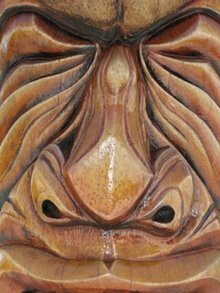 Giveaway at The Tiki Hut! 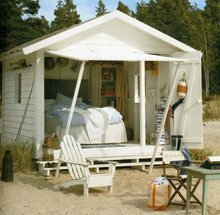 Can I Live in a LIfeguard Station?